What Does a Navy Enlisted Steelworker Do? Steelworkers in the Navy are considered part of the Construction Battalion, better known as the Seabees. This rating (which is what the Navy calls its jobs) was established after World War II when the Navy combined two ship fitter ratings: steelworkers and riggers. The Navy Occupational Specialty (NOS) code for this job is H170. It's also abbreviated simply as SW.
As the name suggests, Navy steelworkers perform many of the duties one would associate with a civilian worker at a steel mill. They rig special equipment used to build metal structures, fabricate structural steel and sheet metal and use concrete to reinforce steel bars. These sailors are also tasked with welding and cutting steel and reading blueprints. Much of what they do involves meticulous planning, from preparing progress reports and construction schedules, and estimating materials, labor, and tools needed for Navy construction projects. The construction projects these sailors work on may include erecting steel bridges, tanks, buildings, and towers, as well as fabricating, installing and welding structural steel shapes and plates for heavy construction projects. They often act as project managers, directing and supervising junior staff, and ensuring compliance with Navy construction specifications, code requirements, and protocols. Navy steelworkers, like their fellow troops, are expected to be prepared for combat, because they may be called upon to perform tasks required in combat and disaster preparedness or recovery operations. These sailors are likely to work in a variety of conditions, both independently or as members of a large team. They have many different duties which may be performed in climates ranging from tropical to arctic, in all types of weather conditions. Sailors interested in this rating need a combined score of 140 in the arithmetic (AR), mechanical comprehension (MC) and auto and shop (AS) segments of the Armed Services Vocational Aptitude Battery (ASVAB) tests. There is no Department of Defense security clearance needed for sailors in this job, but a five-year (60 month) service obligation is required. 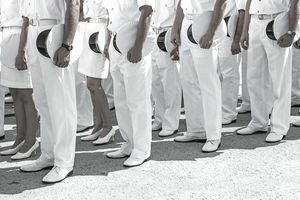 After completing Navy basic training, otherwise known as boot camp, sailors in this rating attend technical school, or "A school" as the Navy calls it, for 51 days at the Naval Construction Training Center on the Naval Construction Battalion Center in Gulfport, Mississippi. As with all jobs in the U.S. Armed Forces. promotion and career progression of Navy steelworkers will depend on the personnel level at the time of enlistment. So, overmanned ratings will have slower career paths than those that are undermanned.